You can watch the video for the past episode recorded on March 21, 2019, above, or you can review the transcript below. Alright, we are live going to get things started. This is episode number 75 of the productivity Academy live Q&A. So we’ve got some cool stuff. Today we’re going to talk we had a question from member about fo Mo, kind of leading into distractions, and that really derailing things and how that’s affecting their productivity. And then wanted to additionally share some information about missing letter, which is a service that I use and had a really good interview with the founder and creator of Missinglettr, Benjamin Dell the last week. So going to talk about that a little bit, show you how I use it, how you can use that to automate some, some of the tasks with social media in a good way. And it was really interesting conversation with Ben. And I’ll tell you a little bit more about that. But before we get into that, if you’re watching live, go ahead, and you can ask questions, and I’ll check them out on the side of the screen from time to time and if it’s time allows will answer those and get to that stuff. If you’re not watching live, you can see in the description below where to come join us how to do all that. And if you’re just watching on YouTube, and checking this out after the fact you can, of course, subscribe to the channel stay up to date with the live Q and A’s as well as other app reviews, and a lot of other content that we put out. So that is all of the announcements I think I’ve got today, I’m going to check out this first question. So let’s see, the first question was, they were talking about having trouble with finding the priorities to do in the first place. Alright, so that’s one thing and then staying on track to get that done. So as an example, they open their phone to do something specific. And then find themselves looking at something else like emails, and then going down that thread instead. So like opening their phone, to do a needed post, and then end up reading emails and download a book on Audible or Amazon, I feel your pain, shiny object syndrome, I seem to have fo mo fear of missing out. And I’m always worrying that I could be missing something important. But instead you end up not getting things done that are crucial to your business. Okay. So there’s several things going on there. But first, I want to say that that is totally normal. You’re in good company, I think this happens to everyone. And it’s more a matter of doing what you’ve done, you’ve already recognized like, where the major issues are. So you’re a step ahead, instead of just saying like, gosh, I don’t know what’s going on. And I just feel like I’m getting sidetracked. Because that’s not the best place to be, because you don’t know yet what’s going on. But right now you’re really identifying it. And so maybe there’s more going on here than just your phone. But let’s start with that. So you’ve already identified what the issue is. And so maybe you do need to do a post on your business page. But what I’m going to say is kind of two parts here, but you set your environment a great, now my phone is over here, it’s literally out of reach. Now granted, I’m doing a live stream, I’m not going to just pick up my phone and start checking stuff. But that’s done on purpose, my desk is wide enough that I can set it so like I have to get up and lean over or grab that or I could put it in the back on like a shelf. Sometimes I do that. So it’s out of the way. And I definitely regardless have it face down while I’m working. And I think that understanding what your big distractions are. And if it’s the phone, then take a more extreme action and see what what happened. So let’s say you work if you work in your home office, try putting your phone in the bedroom, in the kitchen and put it somewhere else, okay, there’s almost no reason I can think of especially if you’re running your own business, why you would literally have to have your phone on you. And if not, you need to work around that, you know, maybe you’re having to answer phone calls. But again, you start setting that environment. And if you’re just totally overwhelmed, you just make it a small part, like maybe one hour a day, you don’t check your phone, or you don’t have it on you. And most people can carve that out. And then you start kind of pushing things out from that so that you have more time. So again, I would say if you open your phone to do something specific, then you know what it is you need to do. And then you should be able to set a time. So maybe if you’re really productive in the morning, you don’t do posts on your business page between eight and 11. And instead, you do that as an afternoon task from having done posts myself, they generally don’t take, you know, that’s not like a super high priority in terms of your mental capacity. I’m not saying that, you know, it doesn’t require thinking or anything like that, you know, you have a lot, you spend a lot of time on it sometimes or you have a hard time writing. But in terms of like what the most important thing you’re going to do is that day, that’s probably not it. So you could relegate that to the afternoon or times where you don’t need like the critical thinking. So I think that that is probably the best way to do it. And then leave your phone, like I said, like really design your environment. And this doesn’t have to be some super complicated thing, and may just be Hey, when I come in and do my daily review Part of my, you know, process for myself, you know, where’s your phone at, go put, if it’s not in the kitchen, go put it in the kitchen or something like that. So, I think that that’s another good way that you can really help yourself. And you can do that with other things as well. You know, whether it’s having a second monitor, so like I have a main monitor in front of me, I have another one on the side. And occasionally, I’ll just turn that one off on the side, because that’s generally where I’ll keep things like Slack, and a lot of communication stuff. And sometimes if I just need to focus and I’m writing or writing, you know, a process down or I’m recording something, I just don’t need to see it, and nothing is going to good is going to come out of that if I get like a flashing alert, it’s going to distract me. And so I just kind of take the action of Hey, you know what to turn that monitor up. The other thing that I touched on that I think is a good way to do this is time blocking. And I had already kind of mentioned that with the with using like a morning time block and maybe moving in this specific example your posting to the afternoon. But you know, really blocking out tasks so that you’re not using things that distract you, I think is you know, a simple and yet another really effective way to do this and saying, okay, when I sit down to do that 8am to 11am work block, what can I do in you know, two minutes to really help myself. And those things are pretty simple, like get rid of your phone, if you haven’t already closed down Skype, if you use it shut down Slack, if you use it, shut down your email if you use it. And if you need to write yourself a little sticky note and just, you know, get used to that, that ability to focus. And you know, you have to go into your email to get something that’s great. But getting in the habit of maybe not having that open will help you so that when you do realize, Oh, hey, it’s still open. And I’ve been reading, you know, six other emails, close it down, get back to where you’re at, in overtime, you just develop that habit, there’s no magic way that I’ve found to doing this, you can use tools like RescueTime to help you get started. And those things will keep you out of those apps. But for most of us, you know, hey, I need to go to Facebook to answer a question or I need to get into my email to respond instead of calendar event or something like that. So I think that that’s a good way to start that habit. The last thing on this I want to talk about is setting up a time each week. And you can do a lot more with this. But I think that one thing you should do. And anyone who’s got this, the same issue is set a time to review what’s working for you. Right? And you know, this could be 10 or 15 minutes, 30 minutes, an hour, whatever you can devote to it. But saying what am I doing that’s working and and what is it? And what could I do about it? setting up this time and saying, well, the person who wrote this comment about getting sidetracked special using their phone? Clearly they know that there’s an issue with their phone. So setting down now and saying, Hmm, well, I’ve tried putting my phone in the kitchen. And either like, that’s work spectacularly over the last week, I’m gonna keep doing it. Or, you know, know, I missed some client calls. So I need to maybe keep it on silent, or the next step is to reschedule client calls. So don’t get them between these times, blah, blah, blah, whatever it is, but that time to review and see, Hey, is this stuff working or not? And then what can I do to get some better results like that? Cool, good question. And certainly something that that takes work. That’s the bottom line, right with a lot of this stuff is fundamentals, but helping yourself along the way. So that you can get a lot more done. And you know, over time, you’ll develop better skills and time management to help yourself make these changes more quickly. But you’ve already got the first part down by already knowing that you know what the main issue is, I am going to go over here and grab some water and check out and see if we got any questions. Okay, don’t see anything right now. So what I wanted to talk about next was Missinglettr. So I had a really good interview with Benjamin Dell, for missing letter. And that’s going to be coming out I believe the podcast episode will be either can’t remember anyway, send a month or two we got a lot of podcasts going on was a great conversation. And clearly, we using something like missing letter, which we’re going to show here in a minute. It’s a way to really help you speed up and do quality, social posting. And it’s pulling information automatically and had a really good time talking to Ben about you know how this works and his thoughts on automation. And you know, one of his quotes is really good saying just because something can be automated, maybe doesn’t mean that it should. And he was in response to what he’s done is something that he uses, right, he’s a product of his product, his company uses missing letter. But just saying that just because you can automate something doesn’t mean you should automate everything. And I thought that that was a really good idea kind of reminded me of a don’t have the exact quote by Perry Marshall. But just saying kind of that it’s like the 8020 rule, well keep applying the 80-20 rule, because you can keep taking the top 80% or you know something and keep doing it and do it and do it. But if you do that to everything all the time, then you know, that can become its own problem and lead to behavior that maybe isn’t great, or outcomes that aren’t great. So with that said, I’m just going to flip over to the other screen. And let’s see if this is working. OK, cool. So this is I just want to go over their description of missing letter. And case mine wasn’t good enough. But it’s really nice that it it pulls basically from your blog posts, and then helps you create the content. And basically, it’s creating it so that you don’t have to, which is really nice for those of us who either don’t have large teams, or who don’t enjoy spending a lot of time doing this or have a social media manager, this is a great way to get someone either on your team to do it part time, or to help yourself save a lot of time. So they’ve got a bunch of cool stuff here that you can read about them now gonna go through this. But I can show you what this looks like on the end. So I always have my assistant grab some goofy pictures of me to put in here. But this is what it looks like they automatically grab a quote out of a blog post, shorten the link back to the blog post, you can have an image in there. And then it goes ahead and post it to your page over time. And on the back end, what it looks like is you have, for example, I’ve got the productivity Academy, of course, and I’ve got a dashboard that just shows Okay, I’ve got a bunch of campaigns to review. Because sometimes I don’t use things like blog posts that either just wouldn’t make sense to have or things that we haven’t posted yet. And then how many are actually running. And what this means is when you pull in a new content, like what’s going into here, so this was last week’s q amp a, so we could review the campaign can go through here, we’ve got hashtags, if you want to use those, I’m just going to ignore that for now because we can edit those. Okay, and here we go. So this is where you can go in here and you have suggested content that it automatically pulls in, and it’s on a timeline. So this is day zero, day three day 714. Anyways, all the way down to day 365. And it’s pulling different content with a short link. And then it will also pull in or create little speech bubbles. And then if you want, you could use images from a place like I think it’s pixels, there’s a couple others, if you don’t have access to like a place to use images, of course, you don’t want to use copyrighted stuff, I can go out and either use my own images that I’ve created for blog posts, or there’s lots of other places. But again, you can cycle through, you have options for the different quotes to use, you can use a quote bubble or a picture, quickly upload, you can change the image manually edit, and you don’t have to post on all of these days, which is nice. So for example, I don’t I believe we do four or five, which is great. So it’s a nice way to show people content again, especially through Facebook, where maybe they weren’t interested in me or my page at the time. And then you know, nine months later, they’re getting to see a blog posts that make sense. So great way to really speed things up been really happy with it. I think I’ve been using it for about a year now. And highly suggest anyone out there, if you’re using Facebook, Twitter, I believe they do LinkedIn as well, I just use it for Facebook, but I find it to be a really, really helpful tool. So you can go and check that out. And on my end, just so exactly how I use it is we write a blog post, what it does missing letter pulls it in by the RSS feed does all this I’ve created a little bit of a process as far as Okay, this is kind of what’s good this is you know, kind of images, we want to do associated with this. And then having assistant do that, and it just takes them an hour, basically to like go through, grab the images and then send it out for approval, which could be you could be someone else, go back if it’s you know, any issues to be made, you can edit it, if not, you approve it. And then I believe on one of the updates, what I’ve seen is that they’ll say, hey, you can go download all of this stuff. Now you just did and use this and other places as well if you want to which I think is a fantastic idea. Because if you’re using this stuff once you can certainly use it again. But and then going back to that idea, like Ben said about you know, you don’t just because you can automate something doesn’t mean you should automate everything. But once you put the time in, maybe you’ve customize these a little bit, you fixed things if maybe you didn’t like the way it pulled out a sentence or paragraph. And so you’ve done this, now you’ve customized this stuff already and put some time into it. So I think it’s a great way to create kind of value added on top of their automation, and then go out and share that stuff again. So actually, what I’m going to be doing over the next week or two is coming up with a process to put this stuff either on Instagram or Twitter, and be able to share that more often. Because everybody has their own favorite place of going. I know that’s the same for myself. And so I certainly don’t expect people, you know, to just see it all go to one social network. And so whether it’s for your business, it’s for your personal page, I think this again, is a great way to get a lot of leverage from quality content. So with that said, let me hop over again and see, don’t see anything else for this week. Cool. Alright, well, I think this will wrap it up. Then reminder, if you’ve ever got any questions, and you can’t make it live, you can go to productivity dot Academy slash questions. And if you’re wanting to really build the foundation, you know, you’ll hear me talk about this from time to time we have the foundation is literally what it’s called. And so short book that I wrote, to get everyone on kind of the same level ground. As far as if you’re building your own business, you know, you’ve got a side hustle, whatever it is you’re doing, it’s no longer enough to really just be productive. And from my point of view, I don’t want to just be productive, I don’t want to crank out widgets. That’s not what I want. That’s what I don’t want for anyone else. But I realized, you know, over several years of building my own businesses, I quit my job as an engineer. And there are a lot of blood, sweat and tears realizing that, you know, you do need some sort of a framework. And it needs to be able to accept these different tools, right, because there’s no app or tool that’s going to fix your time management or make you productive. But you need more than just that you do need that framework that you can use to improve your time management. You can use to automate things like we just saw with missing letter. As well as start building a team and whether that you’re working with people who are contracting, you’re literally building an in house team, or maybe you have some VA is beginning that those areas and getting a framework together that can help you grow is one of the most important things I think you can do. Because it’s translates across any business, right? It doesn’t matter if you’re doing information products, doesn’t matter if your e commerce, it doesn’t matter. If you’re a physical goods store, you need to have a handle on all of this stuff. And then you can grow with that foundation. 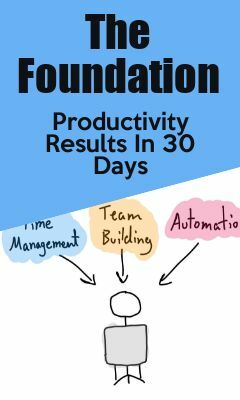 So go check it out, you can go to productivity dot Academy slash to the foundation, find out more, grab it and put it to work. So that’ll do it for this week. Look forward to seeing everybody next week.